As a handmade jewelry designer, I am the one who makes the decision whether a Peggy Li Creations necklace design is long, short, or somewhere in between. The most common necklace lengths (and what you see in stores) is 16", 18" and 20" long. Need help choosing the right necklace length? See the image below (the bust is wearing my Simple Dot Necklaces) for reference. The model is a full-sized clothing model. A choker, collar or petite length necklace would be around 14" to 15". Your necklace would sit just around the base of the neck. You may also want this shorter length for child-sized jewelry. Industry standard length starts at a 16" length. This size fits most! I find that this length hits just below the collarbones on most people. Almost all of the necklace offerings on my website have this length as an option. 18" or 20" is a good choice if you prefer a looser fit. This is also the style known as "princess" length (17" to 19"). This necklace style also gives you a few more options to mix and match necklaces with different lengths/layers. 20" to 24" lets pendants and charms hang a little more freely, giving a more casual vibe. This is also called a "matinee" necklace length. 28" to 34" is an "opera" length. 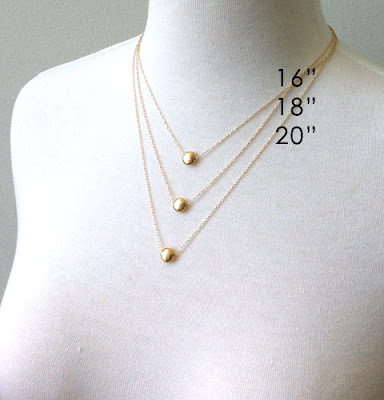 This size may allow you to create a double-stranded necklace option and gives a lot of versatility (like with a lariat). Over 45" is often called a "rope" length, and is the longest option available for necklaces. You often see this length of necklace used in pearl strands. At Peggy Li Creations handmade jewelry, I am happy to work with you to get the length you need. If you don't see the size you need, email me before you place your order and we can start from there on creating a custom jewelry design for you. Peggy Li Creations on Vacation! FAQ: Can I Blog About Your Jewelry?